Introduction: Natural Orifice Translumenal Endoscopic Surgery (NOTES) promises decreased invasiveness by performing intra-abdominal procedures while avoiding the abdominal wall. Data from a randomized blinded study showed significant divergence of heart rate and diastolic blood pressure for NOTES animals compared to laparoscopy animals. We compared animals undergoing diagnostic or interventional NOTES with animals undergoing standard endoscopy over a 30 minute period. Hypothesis: There will be no difference between the groups. Methods: 37 female 50 kg domestic swine were randomized to 3 groups using permuted block design. The diagnostic NOTES group (group 1, n=11) underwent NOTES diagnostic peritoneoscopy using air insufflation. Group 2 (n=14) underwent diagnostic endoscopy with gastric irrigation (no gastrotomy). The interventional NOTES group (group 3, n=12) underwent transgastric mesh placement. All animals received invasive hemodynamic monitoring and ABG at baseline, 10 minutes and 30 minutes. Data collection was blinded from the start of the pneumoperitoneum (group 1& 3) or gastric intubation (group 2). Groups were contrasted with repeated measures linear models (SAS v9.1). The study was IACUC approved. Results: As in the prior study, no difference in the systolic blood pressure was noted. A statistically significant difference in the diastolic blood pressure (DBP) between groups was noted at time 0 (p=0.05). This corresponds with the beginning of the pneumoperitoneum for groups 1&3 and the start of endoscopy for group 2. The mean DBP was 14 points higher in group 2 than group 1 (p=0.02). However two animals exhibited very low DBP and when analysis was repeated after the outliers were removed, the difference did not remain significant. Mean bladder pressure was 5.4+/-6.2 cm H2O in group 1, 6.9 +/-8.4 in group 2 and 5.7+/-6.6 in group 3. Heart rate and ABG values were not statistically significantly different (p>0.10) between groups. Conclusion: Hemodynamic measurements suggest a similar reaction for diagnostic or interventional NOTES and endoscopy animals over a 30 minute time period. 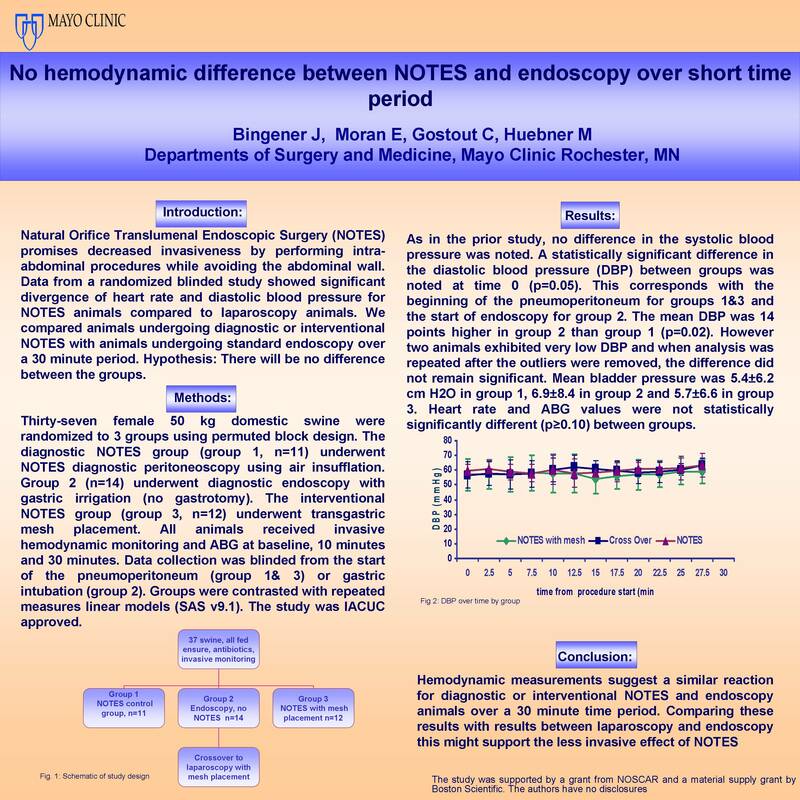 Comparing these results with results between laparoscopy and endoscopy this might support the less invasive effect of NOTES.